Ok, getting sidetracked. So, I like drumsticks, though I rarely ever buy them because of the fat content. Whoa, that's weird, nutrition info on their website doesn't match the box. 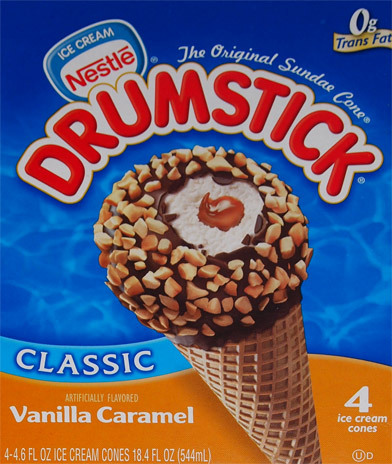 I wonder if they are coming out with a "healthier" drumstick and I just happened to get an old box. Either way, it's still high and I almost picked a different treat (it only took me 20 minutes to decide....it was a big aisle). I was tempted to try the good humor eclairs (for comparison to the hood ones), and then i almost went with one of the eskimo pie treats because they were on sale, as were the klondike bars, but then i realized something. Sure, I get half of my saturated fat for the day in a drumstick, but I'm also getting a big honking serving of ice cream that's going to tide me over for awhile. So with all that in mind, I decided to try the Vanilla Caramel Drumstick because I couldn't remember if I've ever tried it before....well, I won't try it again. Cookies N' Creme is my favorite, and now caramel is at the bottom of the list. I just don't like the caramel they use. Also, as much as I enjoy peanuts, they were just a bit too many and they were going all over the place. I mean, I appreciate the effort by Nestle, but I don't need quite that many.... or maybe they use to stick to the cone better? Positives? I don't think I've ever had a drumstick with a gummy cone, they're always crunchy, and you have to love the chocolaty coating inside the cone. The ice cream is always a decent consistency, though it's hard to give you an exact flavor analysis since it's hard to bite into it without grabbing something else (chocolate, caramel, cone). On Third Scoop: Funny, #3 and #4 were back to having way too many nuts on top, so #2 was a fluke I guess. I appreciate the added protein, but the crunch is just a smidge too much for my ice cream habits. Still not 100% fan of the caramel, it's the kind of caramel that tastes a bit off, almost a coffee or toffee flavor vibe really.